Academic conferences are strange events: a gathering of intelligent and well-informed people, each of whom is either engaged in or expecting to be engaged in serious research pushing the frontiers of human knowledge, who struggle to ask questions in fewer than 200 words. This is my first time at the CSAE conference, though I’ve been to many others over my lifetime (quite how long that lifetime has been was brought into sharp focus when a bullet discussing ‘a long history of research’ discussed a paper that was breaking news when I was studying my undergrad). In some ways, it’s much like the others – lots of very smart people, lots of debate in the margins, Matt’s presentation uniting Walter White, Taylor Swift and several trillion bank transactions. But what struck me most was how varied the methods, interests and worldviews on show were. In particular, I was thinking about how profoundly optimistic some of the presentations left me, and how pessimistic others felt. In the morning, Matt Collin chaired a session loosely focused on trade, and featuring an incredibly striking result presented by Habtamu Fuje: Ethiopia’s investments in market integration (notably infrastructure) have led to an incredible reduction in the impact of drought on crop prices and child malnutrition. I agree with Matt that the paper seems to undersell what a fantastic result this is. Lant Pritchett would describe it as a massive win for Team Development – a vindication of the idea that doing sensible economic policy, planned for the long term underpins a huge array of additional development gains. The returns won’t be the same everywhere (they depend in part on the effects of drought being spatially heterogeneous – which makes it possible to trade your way out trouble), but for those of us who believe that there is a lot about development that isn’t rocket science and just needs to be implemented effectively, it’s hard to think of a more upbeat start to the day. Similarly, I found Ketki Sheth’s results from her lab-in-the-field work in Ethiopia a win for my inner Bobby McFerrin. She found pretty strong evidence that discrimination ‘from below’ (i.e. female managers being undermined by their workers) was primarily driven by beliefs about their ability. Investing in a signal that demonstrates their competence updates behaviour to compensate for the initial discrimination. The result reminded me of Chris Woodruff’s experiment in Bangladesh with female garment factory managers, which demonstrated a similar mechanism, if I recall correctly. Probably the most interesting paper I saw today, though, left me feeling pretty pessimistic. That was the work Pamela Jakiela presented. 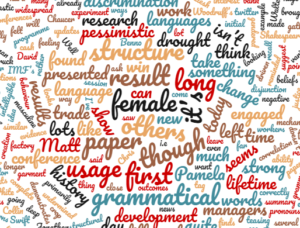 She looks at ‘gendered language’, that is, languages that have a structural disjunction between masculine and feminine, and finds a strong negative correlation with female outcomes. Why does this leave me down? Well, they are looking at the grammatical structure of the language, rather than usage; so while usage can change quite quickly (as for example with the creation of new pronouns in English), the deep grammatical structure seems far more fixed – think about how the grammar in Chaucer or Shakespeare is intelligible to a reader today, even though the words and usage is so different. So is the implication ‘have a different history’? That was my first take, but after speaking to Pamela later in the conference, she pointed out that there are examples of languages that made conscious or unconscious but widespread changes to their grammatical structure. So this isn’t destiny – it’s something that can change over time. Not an intervention that’s going to show results in a year like a cash transfer, but something much deeper that will correspondingly take longer. This summary doesn’t come close to doing justice to the first day – I haven’t said a thing about Benno Ndulu teasing Jonathan Ostry about the IMF’s new interest in inequality (products of a programme with DFID), but if you want a more complete blow-by-blow, I suggest the #OxCSAE2018 tag on twitter. David Evans has already summarised about 20 papers. Seriously – how does he do it?